A few months ago I was sent some plane tickets to fly to Idaho to provide some lessons in Final Cut Pro for a new user. She was starting with Final Cut Studio 1 and I saw this as a good opportunity to clear out some of the older books taking up room on the bookshelf. I chose the ones I thought would be the most helpful, including Rick Young's Final Cut Pro 5 Easy Guide. During the course of my 3-day stay, when we had finished for the day, I would bring out a new book as a surprise present, hoping she would use these after I had left. A few days after I returned home I gave her a call. Of the 5 or 6 books I gave her, the only book she had read was the Focal Easy Guide by Rick Young. 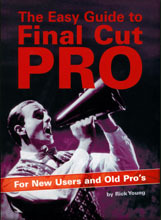 There is a good explanation for this, and with the release of his new version for Final Cut Pro 6 what better time to highlight just the book for a great many users of Final Cut Pro. Aimed primarily at the new and intermediate user, Rick Young has successfully updated his Final Cut Pro 5 edition with new sections covering many of the new features found in FCP 6 and additional techniques designed to accomplish a quicker and more efficacious workflow and, more importantly, a deeper understanding of this venerable application. In a relatively brief 255 pages, the Focal Easy Guide to Final Cut Pro 6 takes the user through all the basics and then some. Rick Young begins with an interestingly written segment on hardware and software requirements, a discussion of the history of editing prior to the use of fire wire and non-linear editing, and various video formats. He then moves on to a complete and comprehensive coverage of the proper installation of Final Cut and an easy to read explanation of the FC interface. Here, Rick gets down to business with step-by-step methods designed to get you up and running learning how to apply transitions, filters and compositing techniques. Thankfully, Rick devotes a section to 'Handles', something that always seems to elude the new user. The big thing with this book is that there is no intimidation factor. Supplemented by colorful graphics, there is nothing confusing about his friendly writing style. While so many manuals are goal based, in that supplemental project discs are supplied for you to complete a project by, too often the editor using these books completes the steps without a clear understanding of why he/she is taking the steps in the first place. With Rick's Easy Guide, no tutorial discs are included so there are no 'author's projects' to work on. Better yet, with the Easy Guide, you can focus on and apply what you learn immediately to your own project sequences. Rick provides clear explanations for each step so that, once learned, you understand and can apply your learning to all of your projects not limiting yourself to just the one on another's manual. There is an entire chapter devoted to Audio, another facet of editing often given short attention to. No one should skip this section as Rick does an outstanding job, especially when instructing the use of Audio Splits, with excellent suggestions given in a clear and concise manner. Chapters covering the use of Compressor, Pro Res, the Multi cam capability are just as comprehensively reviewed, and I doubt that even though this book was not designed to be the be all and end all reference source that other authors suppose theirs to be, most all questions and concerns will be more than adequately answered. Nothing is perfect, with more and more editors, pros and amateurs alike, shooting in HD and HDV, Rick Young does bring up the fact that editing in HD/HDV can be more problematic than when in post with SD. 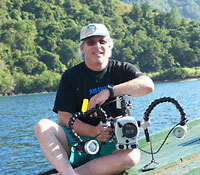 However, he really doesn't address the different problems or how to circumnavigate them. In today's world, a more expansive discussion would have been warranted. Bottom line, the more I learn, the more I realize that there is still, and probably always will be, much that I do not know. 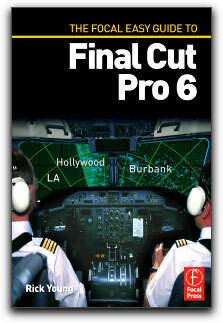 Even when reading the Focal Easy Guide to Final Cut Pro 6, cover-to-cover, I picked up a few excellent tidbits of info. Rick Young's' easy going writing style makes it a pleasure to read and I couldn't recommend it more.